Michael almost went home to Queensland after Collingwood did not draft him at the start of 1997, but was coerced into staying by Nathan Buckley. It proved to be a good move as he was promoted from the rookie list when Trent Hotton was dumped. Born in Papua New Guinea, he moved to Queensland at the age of three. He is the grandson of Robert Michael who played one game for Collingwood in 1906. Michael claimed a small piece of history as the first man to play AFL football under the newly introduced rookie system. 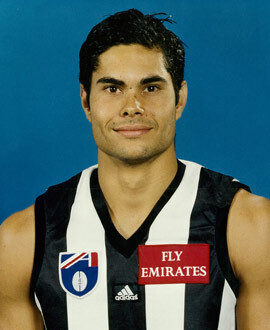 In his younger days he had trained for a full pre-season with Brisbane and was just 68 kgs when he arrived at Collingwood. He eventually reached 100 kgs. He had to play in key defence roles in his first season against bigger and taller opponents and his determination soon struck a chord with Magpie fans. He was a nomination for the Norwich Rising star award in his first year. In 1998 he had to overcome an ankle injury early in the year then a nagging back injury that turned out to be a stress fracture, but still managed to finish fourth in the best and fairest. His confidence developed in backing himself and he had added several kilograms to his frame. At the start of 1999 he was still troubled by his back and had to wear a brace. He missed the first five games of 1999, but then returned to the side and picked up form. For a couple of games he was even pushed up into attack to add bite to the forward line. Considering the bad start he did well to finish 10th in the best and fairest voting for the club. An ankle injury chopped two months out of his season in 2000, but it was a surprise when Collingwood traded him to Brisbane in its keenness to gain a forward in Jarrod Molloy. Michael had the last laugh, becoming one of the defensive rocks on which the Lions 2001-03 dynasty was built.